0 to placemat in 45 minutes! I continue to be impressed by the incredible speed with which thicker yarns weave up. I finished my prototype placemat in under an hour, and the first “real” placemat in just forty-five minutes. 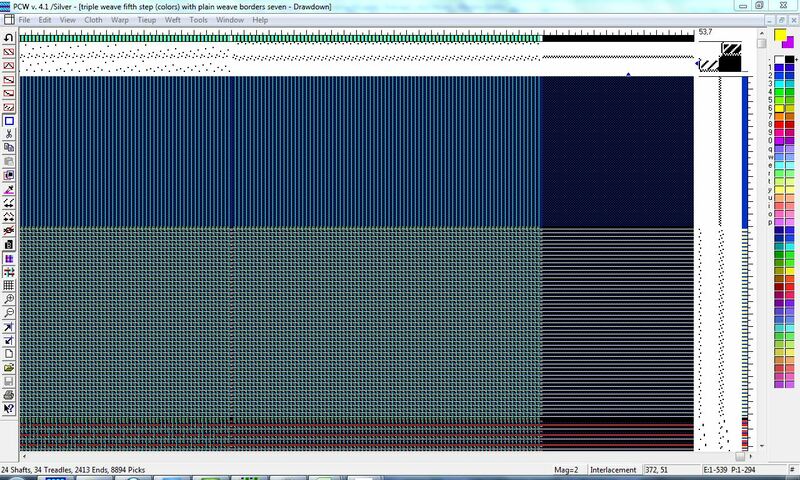 And that’s with a two-shuttle weave! Compared to the fine-threads weaving I’ve been doing, that’s total instant gratification. I really like this! 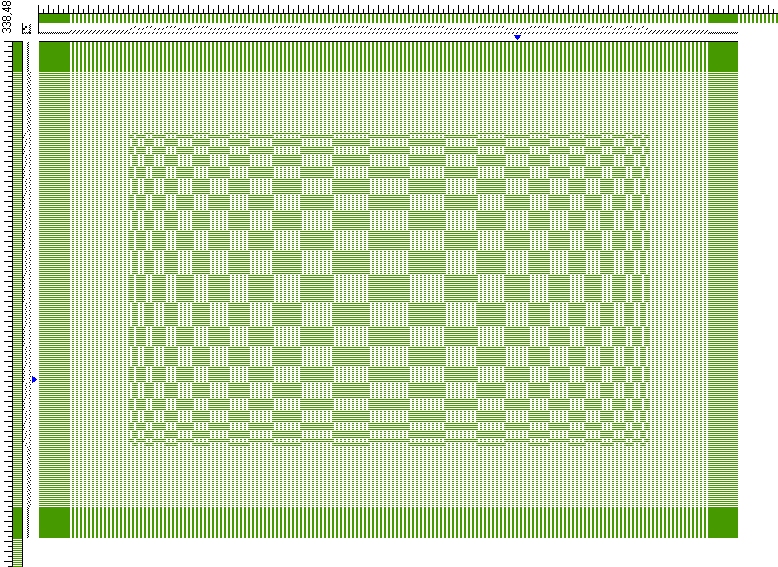 It’s on the small side for a placemat (12″ x 18″) but definitely in the acceptable range, and the trompe l’oeil checkerboard design adds curves and a sense of motion to something that often feels too static. My one gripe is that a reasonable size dinner plate covers up most of the design, but that would be true even with a larger design. 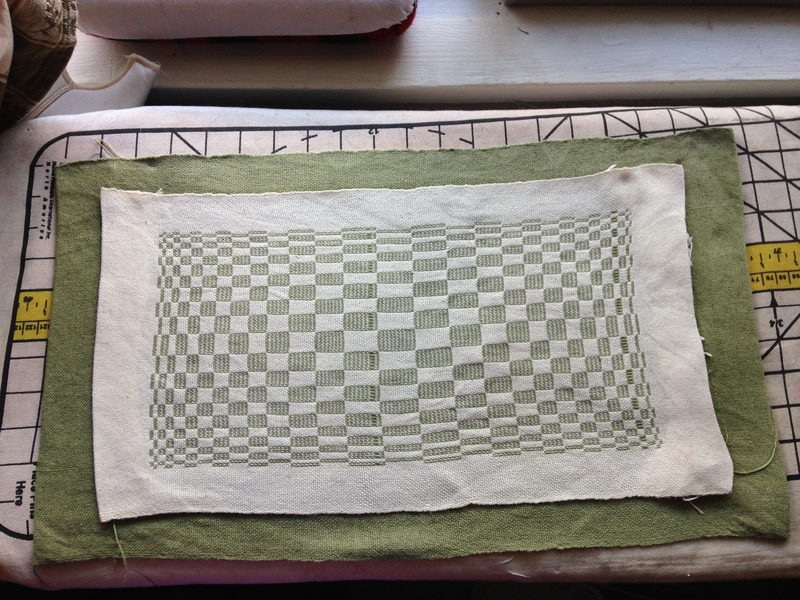 If I were weaving it over I would make it about 15″ wide and correspondingly long, but I like it quite a bit as it stands. So I used the shortened version in the final placemat design. Truly, “magic in the water”! I cut off the shadow weave warp on Saturday. The tiny pang of regret was immediately overwhelmed by glee over the next project – a set of six placemats plus a table runner in naturally colored 10/2 cotton. It’s a modest warp, only 492 ends, in 10/2 cotton, and after spending several months on a 2800-thread warp in 140/2 silk, getting it on the loom was instant gratification. I wound, beamed, threaded, sleyed, tied on, debugged, and wove the first six inches between Saturday afternoon and Sunday evening – just a bit over 24 hours! Now that’s fast. (Well, for one of my projects, anyway.) I did cheat a bit and tied on with large groups instead of smaller knots – but since I’m cutting off for samples in a few inches anyway, I don’t think the knots will cause any problems. 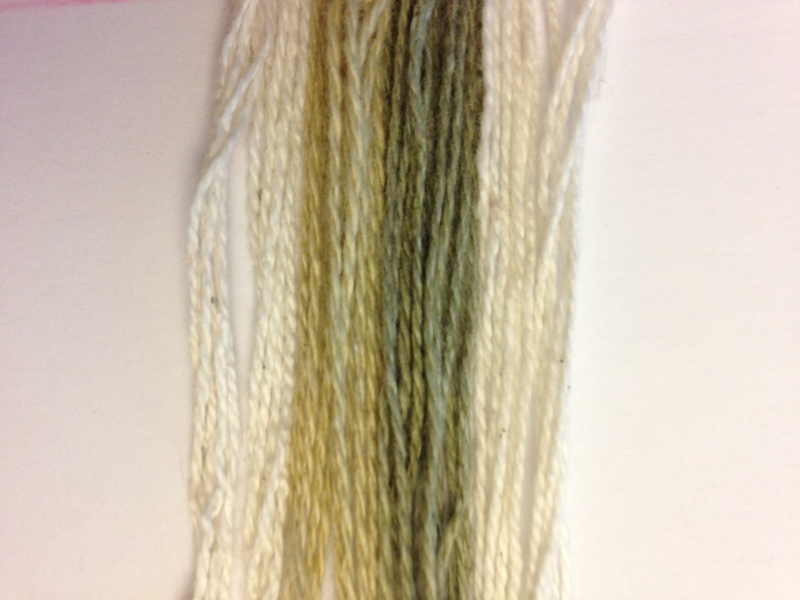 The white and pale olive yarns on the left are before washing; the dark olive and white on the right are the same yarns after simmering 10 minutes in baking soda, detergent, and water. Quite a difference, no? I’m still tweaking the warp and sampling. Because the piece is a mix of double weave and integrated cloth, I sett it at 40 ends per inch, or 20 epi per layer. That is on the loose side for the plain weave layers, but still produces acceptable cloth. 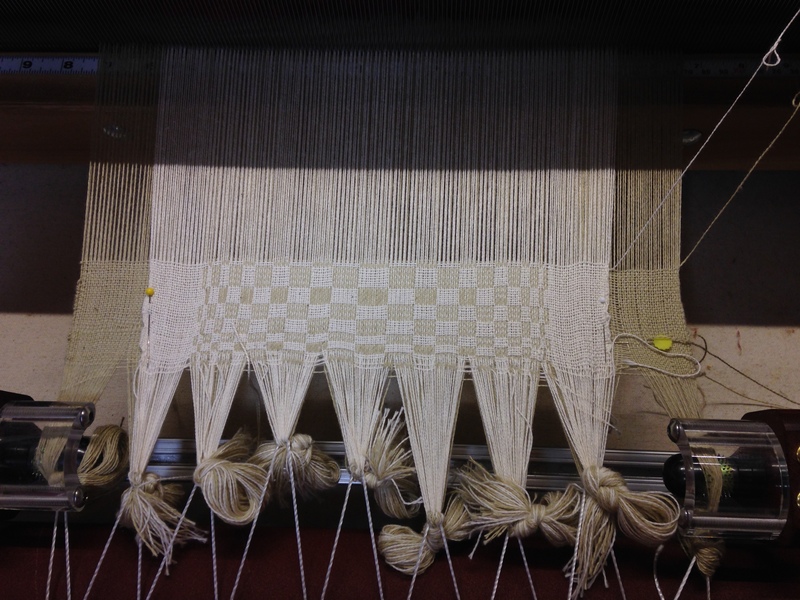 And it is weaving quite well in the sections of integrated cloth. I’m guessing that after boiling in an alkaline solution, the plain weave sections will tighten up and I’ll get a really nice cloth. But I’ll need to cut off and wet-finish the sample to know for sure! I also need to set up the auto-advance, which will be the first time I’ve used it. More experimentation needed! The cloth is an experiment with an idea I’ve seen floating around Complex Weavers for awhile – particularly in Pat Stewart and Ruth Blau’s beautiful work. It’s double weave with separate selvages, but with one warp wider than the other. So the green layer is about 1.5″ wider on either side than the white layer, and both layers are separate at the selvages, resulting in a border of pure color around a mix of double weave and integrated cloth in the center. The beauty of this particular pattern is that it looks complex but is really only two blocks, meaning it can be woven on an eight-shaft loom. 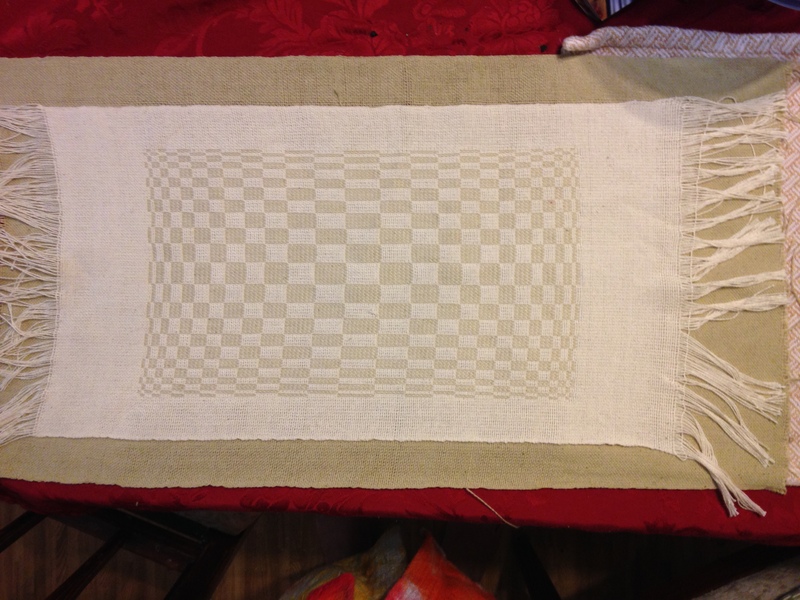 I’m planning to enter it into Handwoven‘s “Handwoven for the Home” contest – six place mats and a table runner. I think I will also weave matching napkins, as I have plenty of yarn left over and I think it would be nice to have a matching set of table linens. I’m not sure whether I’ll keep them myself or gift them to others – I have some relatives whom I’m sure would love them, but we could use a set of handwoven table linens ourselves. And now, it’s off to work on the book. I’m having trouble with the current chapter, and will need to do some serious rearranging to make it work. I’ve spent two days already playing hooky with the loom, so I really need to buckle down and get some writing done. 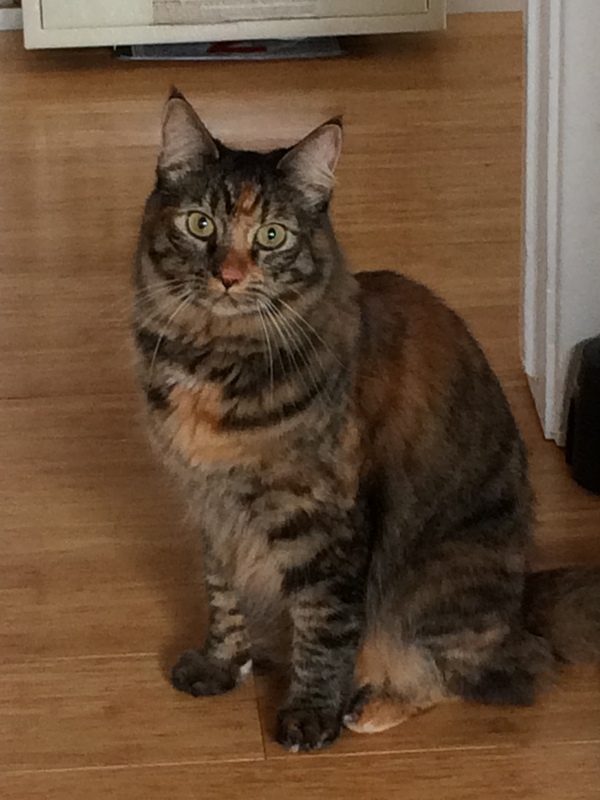 And here is your cat for the day: Tigress, looking beautiful as usual. I love this photo because it really captures the rich colors of her coat. It was taken in low light, which would be a flaw if printed, but which produces a nice painterly effect when viewed full size. We’re now in Chicago, visiting Mike’s family. 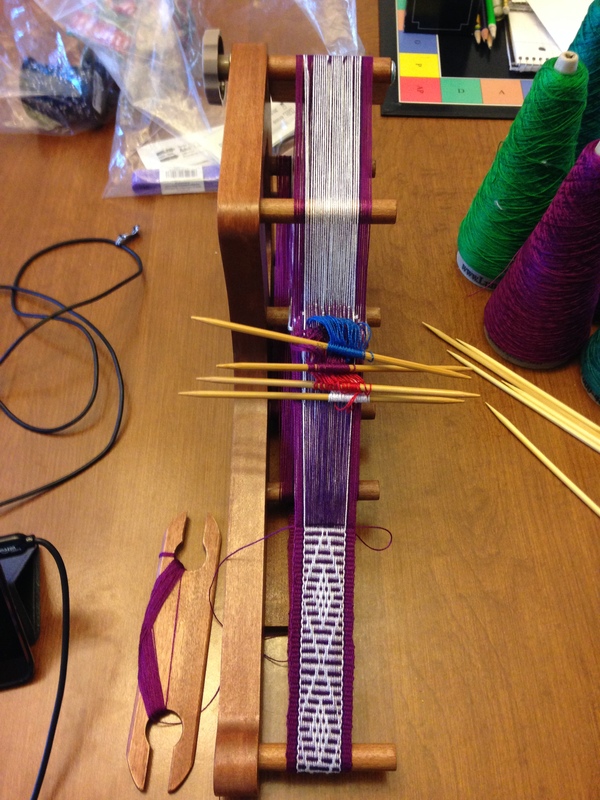 I’ve been continuing to play with the inkle loom, among other projects. I put on a warp that alternates dark purple and white in the center – which turned out to be a major mistake, as doing pickup in dark purple threads is a real eye test. So far, I pass, but after a few hunched-over hours I decided there had to be a better way. I looked up a tutorial on tying continuous string heddles (thank you, Laverne Waddington!) and promptly tied four sets of string heddles – one that picks up every other white thread, one that picks up the remaining white threads, one that picks up every other purple thread, and one that picks up the remaining purple threads. Since my current design involves picking up every other pattern thread, I figure I’ve got my bases covered. So far inkle weaving is proving to be more of a side entertainment than a serious interest. It “feels” more like knitting than like weaving to me, perhaps because of the extensive hand manipulation. Design doesn’t seem to be that complicated, though I’m not attempting to design my own just at the moment (no graph paper!). 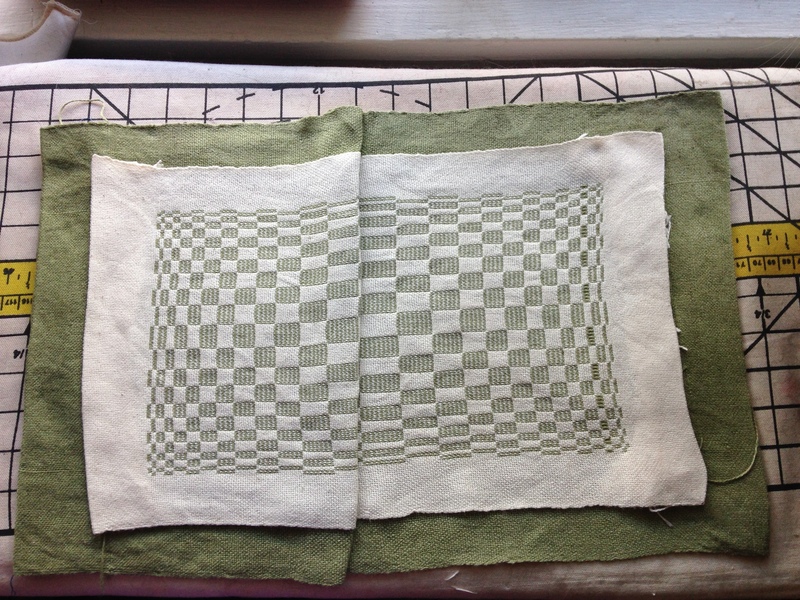 But I’m enjoying weaving some of the patterns in Anne Dixon’s The Weaver’s Inkle Pattern Directory. 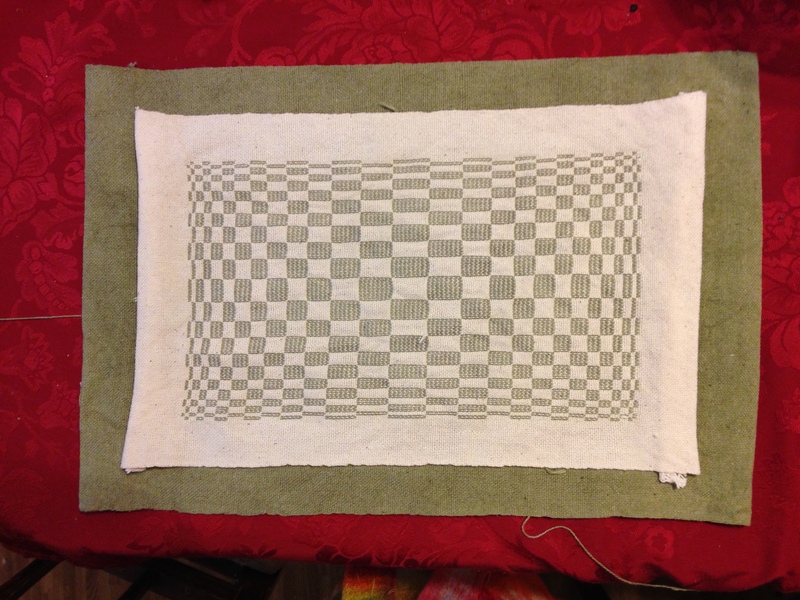 I’ve also been working on an entry for Handwoven‘s Handwoven for the Home reader contest. 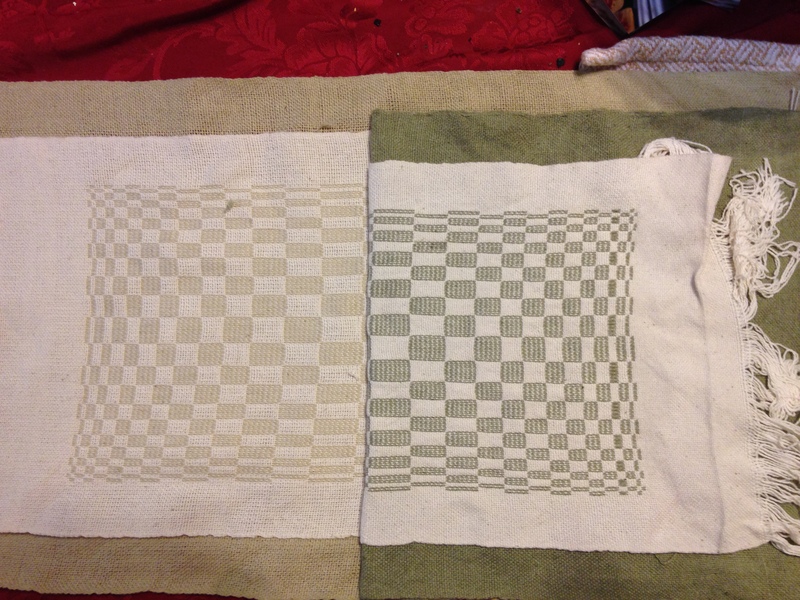 I’m doing placemats with a matching table runner – the table runner being basically a series of three or four shortened placemats. The structure is double weave with one layer narrower than the other, and all four edges as separate cloth. I got the idea after buying one of Pat Stewart’s lovely shawls in mixed doubleweave and integrated cloth for my sister-in-law. Pat was kind enough to send me the .wif for the shawl, which helped me figure out how to get the four edges as separate layers. While I still need to rework the structure in the center, here’s the basic idea. The edges will be dark green, the white area in the center will be solid white. The center will be a mix of pure white double weave and integrated cloth. I’m planning to weave this up in Lunatic Fringe’s American Maid yarn, which is naturally colored cotton, in dark green and white unmercerized 10/2 cotton. I think that should be quite attractive. I’m also considering making a matching set of napkins in twill blocks, with a similar pattern, but that would have to be on a different warp. We’ll see if my interest lasts that long. 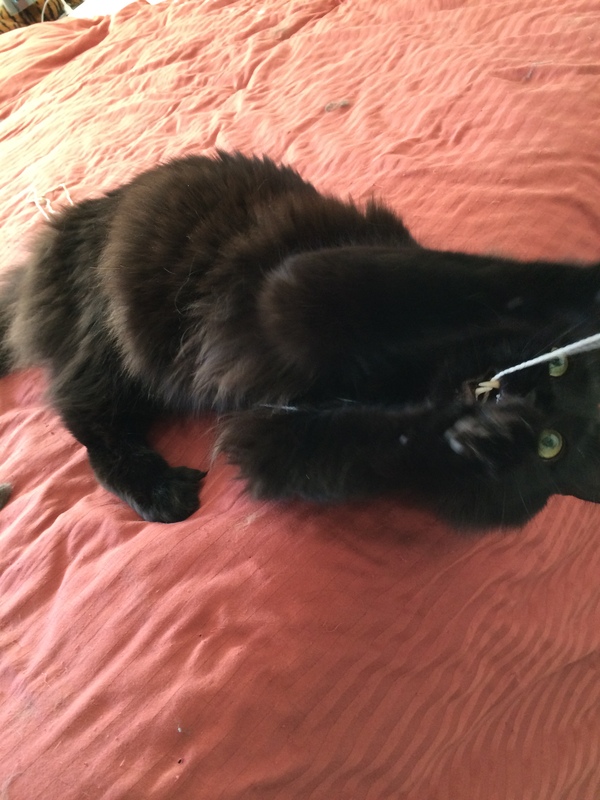 Meanwhile, the catsitter continues to send us photos of our adorable “kids”. She has a real talent for capturing their spirit. 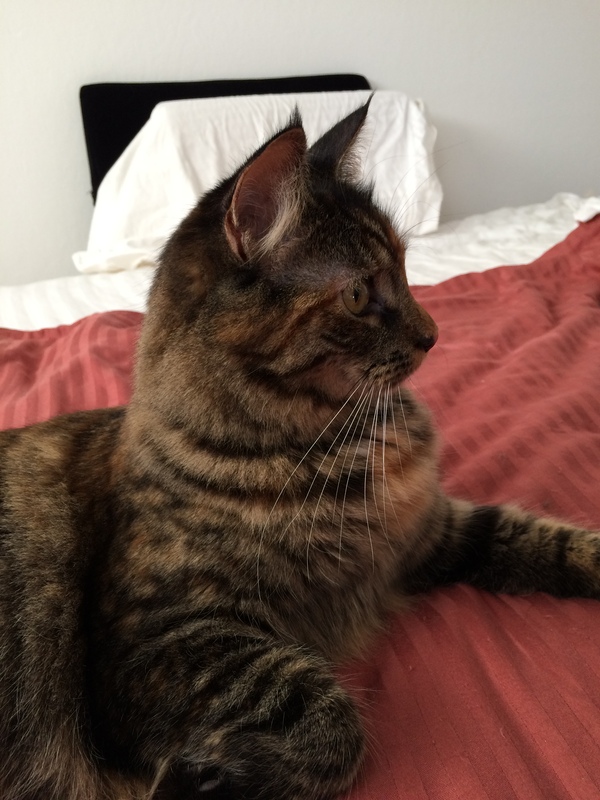 Here’s a great photo of Tigress sitting around looking regal (no doubt just before perpetrating something naughty!). Since this is virtually illegible, I’ve uploaded a .zip of the .wif file here: triple weave draft, zipped .wif file.Â It probably isn’t much more comprehensible, but at least you can see it a little better! Basically what’s going on is three warps and five wefts (! 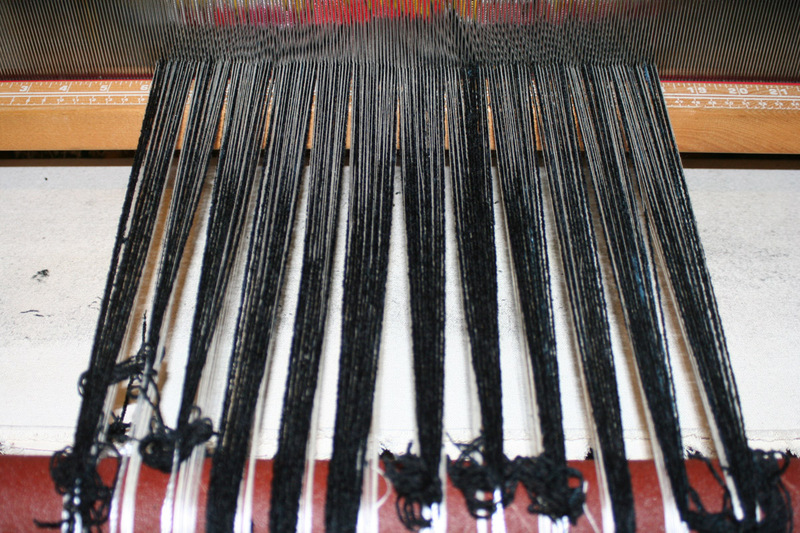 ).Â Two of the wefts are thick wefts, and I’ve indicated those in red and brown.Â They’re also larger than the others.Â One weft (dark blue) is for the middle layer, and the two tabby wefts are white and yellow, respectively.Â The black warp is the middle layer, the other two are top and bottom layers.Â The first section is solely middle layer, the second section is all three layers but without the thick wefts.Â The center section is three layers with the thick wefts. 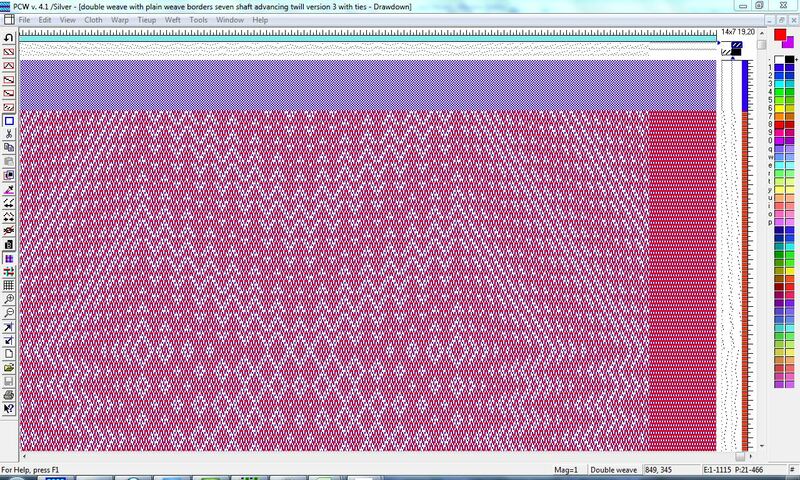 Having spent three hours generating this, I realized that I was probably going to have to redesign the draft after determining the proper sett for two layers of plain weave and one layer of tied weave.Â This one is designed around a sett of 120 epi, and the correct sett for three layers is probably considerably less, maybe 108 or 96?Â The odds are that I will have to scale down the design, which would mean having to redo the whole thing.Â But I learned a lot this morning, and captured the steps in Evernote, so I don’t think it will take me three hours next time!